(Reuters) - British Prime Minister Theresa May is considering a plan under which Britain's exit from the European Union would be delayed for up to two months, the Telegraph reported https://www.telegraph.co.uk/politics/2019/02/24/exclusive-brexit-will-delayed-two-months-plans-considered-theresa on Sunday. 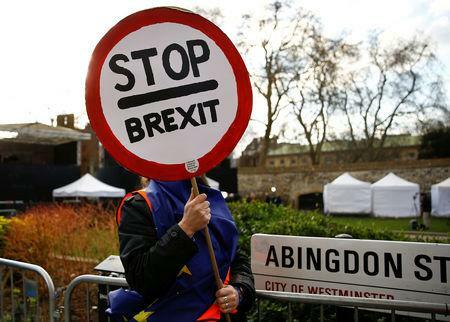 UK government officials have drawn up a series of options, which were circulated at the weekend, in a bid to avoid resignations by ministers determined to support a backbench bid to take a "no deal" Brexit off the table this week, according to the Telegraph. Those options include making a formal request to Brussels to delay Brexit if May cannot secure a deal by March 12, the newspaper reported, without citing sources.